CNBAM followup: The why, how and results (so far) of the Revolution. Revenue has held steady since switching to three days a week, and online traffic is up 218 percent. Props. What we learned by gutting our home page for GameDay Live. Awesome experiment by the Daily Emerald with a few solid takeaways. Running? Check. Rest of today: WordCamp Portland, soft-relaunch ONA conference homepage, prep Daily Emerald presentation for tomorrow, Edit Flow refactoring and driving to Eugene. Mad props to Ivar Vong and the rest of his team who finally pulled it off. They did the switch to “web-first” too. It’s been a long time in the making. Teasing WordPress posts with YQL, jQuery, JSONP and iframes. In Ivar Vong’s first post for the Daily Emerald web development blog, he discusses an ingenious workaround for bringing outside content to a College Publisher homepage. Using YQL for external data could be an intriguing user experience experiment. The CUNY J-School homepage currently uses Simple Pie to pull at least six RSS feed and, when the cache is being refreshed, the page load time can spike. Dotters-Katz and Papailiou’s proposal would add two justices to the existing five-member court and require it to submit rules changes to the Senate for approval. It would also re-establish the Elections Board as an independent entity to avoid conflicts of interest that Papailiou said were endemic under previous administrations. There’s something wrong with this picture. I’m not talking about the proposed changes, rather it’s in the way that the information is presented. Reporting in the “traditional” news brief format, the reader (me) is left more confused than informed. There is almost zero context associated with the article, and I haven’t the faintest idea what the information presented actually means. Such is the old paradigm. Newspapers are dead; long live newspapers. I’m of the opinion however that the new paradigm, the one that everyone’s afraid of, is actually improving journalism. Go figure. For instance, if the Daily Emerald had the innovation, talent, and tools, I would have been presented an array of options to expand my knowledge about Dotters-Katz, how the ASUO runs, and why he proposes a change to the Constitution. There would likely be a list of previous posts on this issue, a small topical wiki in the sidebar synthesizing the pulse of ASUO, and curation of student blogosphere reactions to the announcement (like this one and one from the Oregon Commentator), among other forms of information. Instead, the readers get nothing better than a press release and I have to use Google, coincidentally, to educate myself further. Google is taking the place of the news organization largely because the newspapers are flailing. Get with the times, please, and use the infinitely useful and flexible platform the internet gives you to empower your community with information. 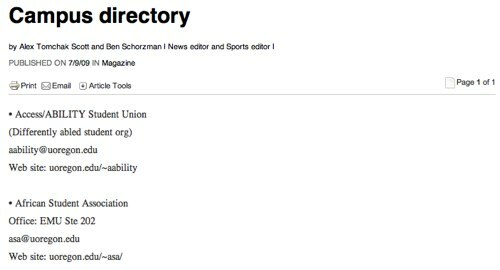 Oh wait, the Daily Emerald runs College Publisher. Make sure your CMS is open source, and then innovate.